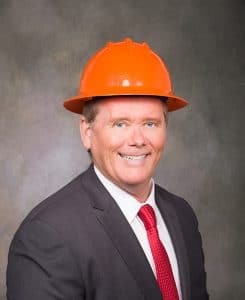 Mike Gray is a San Luis Obispo construction lawyer with over 18 years of experience representing design professionals, general contractors, subcontractors, and material suppliers with mechanics liens/stop notices, CSLB license defense and breach of construction contract cases. Mike Gray is a local San Luis Obispian who graduated from San Luis Obispo High School. After high school he left San Luis Obispo for the “big city” of Southern California to pursue his education and legal carrier. Mr. Gray spent most of his career as a partner at two large well-respected Southern California construction law firms. In 2014 Mr. Gray decided to switch from the large construction law firm to the medium size construction law firm of Plumtree & Associates. This was to allow Mr. Gray to develop a more one on one relationship with his construction contractor clients– something that is difficult to achieve at a big law firm. In 2015 Mr. Gray decided it was time to return to his roots in San Luis Obispo and take his big firm experience back to San Luis Obispo. Mr. Gray did this by opening Plumtree & Associates’ San Luis Obispo Office. In his free time Mike enjoys spending time with his dogs and hiking. Mr. Gray has over 18 years of experience representing design professionals, general contractors, subcontractors, and material suppliers with mechanics liens/stop notices, CSLB license defense and breach of construction contract cases. Please contact us below and let’s talk about how we can be of best help for you and your situation.